The labor dispute which disrupted the broadcasts of Radio Canada International since March 22nd has finally been settled. RCI news bulletins came back on the air on May 25th and other programming will gradually return on the airwaves. Bartolina Sisa Radio from La Paz Bolivia has been heard on 6883 kHz by Samuel Cássio in Brazil on May 23rd around 1000 UTC with Christian programming in Aymara. The same frequency was used last year by Radio Impacto Cristiano in La Paz. More info on the South America Forum and a station identification in the audio section. Peruvian news station CPN, short for Cadena Peruana de Noticias, made a two-month visit on the new frequency of 6150.4 kHz, logged by Kenneth Olofsson and Björn Malm. The station is ex-Radio Concordia from Arequipa, which used to operate on 6141 kHz. More info from Bandscan Quito on the South America Forum, which also includes many new unidentified stations. See also profile article of CPN. On July 14th Gert Nilsson observed that the station had returned back to 6141 kHz (more on the South America forum). IdFM - Radio Enghien near Paris, France has just been given a temporary authorization to broadcast on mediumwave on two frequencies in the area of Verdun. 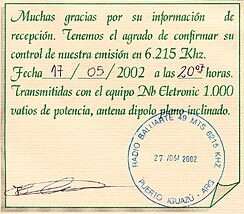 This temporary license is valid from May 1st to August 31st 2002 on the frequencies of 1071 and 1584 on the site of Douamont - Verdun with a power of 50 watts. The station has not yet been reported by DXers, so presumably it is not yet on the air. The station website gives no indication of the AM frequencies. IdFM has been operating on FM 98.0 MHz since 1983. Contact info: 46 Avenue de Ceinture, 95880 Enghien-les-Bains, France. Email: idfm@fr.fm, tel. 01-39-64-20-49. The United Nations Mission in Sierra Leone (UNAMSIL) has had a shortwave station in operation on 6140 kHz since 2000, but it wasn't logged in the international DX press before April 2002. Ralph Brandi from New Jersey U.S.A. was the first to log the station on 6137.84 kHz on April 20th 2002 at 0635 UTC. See more of the loggings on the Africa Forum and a profile article on the station. The 1 kW transmitter has since been logged several times also around 23-02 UTC, but seems to be an easier catch in North America than in Northern Europe. A new Romanian station was observed in March on 1602 kHz by several Scandinavian DXers, but its identity remained a mystery for weeks. Finally Mauno Ritola from Finland was able to discover that Radio CNM from Arad has begun broadcasting. See contact info on a Romanian website and more info on the Europe forum. Jakada Radio International began transmissions to Nigeria on May 1st. The station is run by former Nigerian ambassador to Spain, Yaro Yusufu Mamman. For the moment the station is on the air on Mondays, Wednesdays and Fridays at 1900-1930 UTC on 12125 kHz via an unknown transmitter site. The station has been heard in Europe and the Americas with a strong signal. Sample station identification in the audio section and more info on the Africa Forum.